This week celebrities wore all black to the Golden Globes, Cardi B shared the ultimate throwback picture, while Asahd Khaled hit the studio. 1. 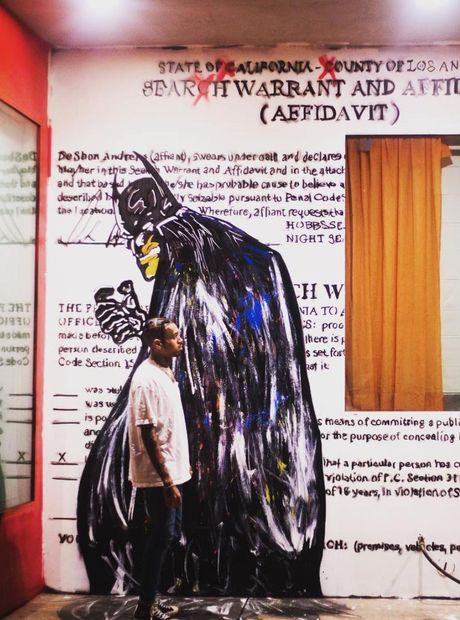 Chris Brown painted the search warrant from his 2009 Rihanna assault case on his wall. "Writings on the wall!!! My first search warrant. 9 years later I’m HUMBLE, GRATEFUL, INSPIRED, AND MOST OF ALL.... IM A MAN NOW...." he wrote on Instagram. 2. Celebrities all wore black to the 2018 Golden Globes in LA. Everyone chose to show solidarity over recent stories of sexual misconduct in Hollywood using the hashtag #TimesUp and #WhyWeWearBlack. 3. Drake spent time with actors from Stranger Things including Milly Bobby Brown and Gaten Matarazzo. Drizzy and 'Eleven' hung out at the official Netflix after party. 5. Common looked sharp in his all-black suit. 6. While Mary J. Blige dazzled in a black dress. 8. And Mariah Carey looked stunning on the Golden Globes red carpet. 11. Cardi B revealed a throwback picture of herself as a child. "I MAKE BLOODY MOVES, Since kinderBarden," she captioned the Instagram post.